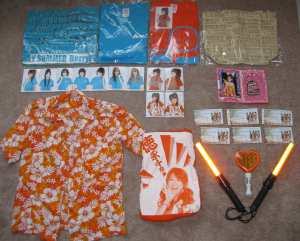 I was in Japan May 9-25 and so had the opportunity to see Berryz Koubou in concert. Six times, no less. What can I say, the concerts were awesome. I really enjoyed seeing the girls again and to see the performances of the songs from their 6th album, I had a great time. As with my first trip to see them at their concert last fall, this one had a special significance as well. I got to see Chinami on her Birthday! What a very special experience to be in the front row for that one. The concert on Chinami’s birthday, 5/22, before the encore, everyone was shouting Chinami’s name instead of the chant they normally do. For the afternoon concert, during the encore there were sunflowers again, like last year. For the evening concert, since Chinami said she wanted to have a “COLORFUL” year, we made a rainbow out of our glow sticks for her. It was coordinated so that each column of about six seats would have a certain color, and the second and third floors would have white ones, representing the clouds. It turned out really well and you could tell that Chinami was really happy. I’ve not much more to report, thought there were many more happenings, but I just wanted to say that I had the time of my life. I really can’t wait to see them again! Very cool! I plan to see them in November, can't wait! Nice. Hope you enjoy yourself! I might make it out there in November too. Wow, that glowstick rainbow is absolutely beautiful. It must have been incredible to be a part of that! I'm really happy that I was able to be there, yeah. Props to the guys who organized it all. Chii loved it~.